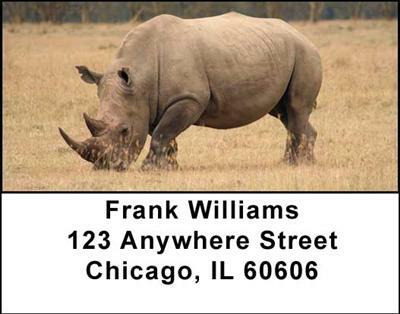 "Rhinos Address Labels" product is already in your cart. For those who like to stand out in the crowd these Rhinos Address Labels will certainly do the trick. These rather unattractive animals have a prehistoric look to them that makes them very intimidating and the spiked horns that stick up on their heads gives them a menacing look too. With four different scenes that display this large animal well, you will see single rhinos as they lie on the ground, others that show them eating the grass and a truly interesting one that shows a pair of rhinos going head to head like they are about to kiss. It is a sure thing that these Rhinos Address Labels will get attention.